A physician and a new biologic drug have been freeing eczema patients of endless itch. 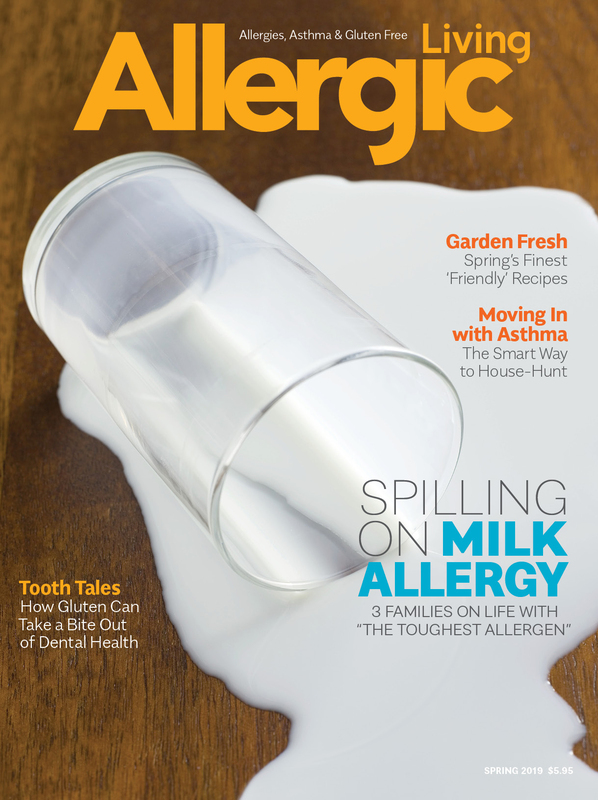 Since this article first appeared in Allergic Living magazine in 2017, the FDA has also approved the biologic dupilumab for steroid-dependent asthma, and it is now be studied in food allergy. Learn about the impact the drug can have in this feature article from our editor. AUSTIN Jacobson had tried it all. 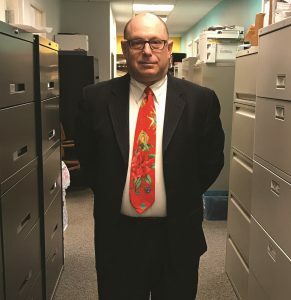 In an effort to soothe the chronic eczema that ravaged his skin, the New York City attorney had been to five different dermatologists, and attempted to sleep – or “marinate” as he calls it – slathered in moisturizers inside a latex suit. Desperate to stop an itch he felt “from the bones out,” Jacobson visited a holistic practitioner, who sold him expensive and useless vitamins. He also experimented with Traditional Chinese Medicine, but the “special tea” he was told to drink was so foul-tasting that he could not keep it down – and he tried, repeatedly. An estimated 17.8 million Americans have at least moderate eczema, so it’s a condition that is exacting a widespread toll, mostly in children but also for about seven million adults. During his bad flare-ups, the skin on most of Jacobson’s body was covered in lesions; he was a walking wound. Attorney Austin Jacobson: he's enjoying 'a second life' after years of non-stop itch. Jacobson largely stuck to Western medicine, even visiting a psychiatrist who had the nerve to suggest the eczematic flare-ups could be psychological. As if. “It was never in my head,” says the 54-year-old. A leading dermatologist at the Icahn School of Medicine at Mount Sinai tried putting him on two different calceurin inhibitor creams, one of which finally afforded some relief. But it didn’t last. As always with his degree of disease, the effects plateaued, and the eczema and the itching returned with a vengeance. Then during an appointment, that doctor, an expert in psoriasis, informed Jacobson that a dermatologist had been hired with a specialty in atopic dermatitis, and she was starting to conduct research. And so Austin Jacobson met Dr. Emma Guttman-Yassky, the physician who would change his life. IN A small library at Mount Sinai’s school of medicine in New York’s Upper East Side, Guttman-Yassky is talking about more than a clinical study. She is talking about a revolution in a disease. There had long been debate about whether atopic dermatitis is primarily a disease of skin barrier dysfunction or a condition driven by the immune system. Was it “outside in” or “inside out”? When an important barrier defect was discovered in 2006, “outside” took the lead as the prevailing theory. But Guttman-Yassky remained firmly in the immune-based camp. She had watched as research found psoriasis to be a condition driven by immunologic pathways. She felt there were similarities in that disease and eczema – from thickening of the skin to the inflammatory cells. The question was: How to use those similarities to produce a therapy for moderate-to-severe atopic dermatitis? She got her chance in 2011, after joining Mount Sinai’s dermatology department. Fortuitously, scientists over at Regeneron Pharmaceuticals were interested in allergic diseases and were producing biologic drugs, including one named dupilumab. After a small trial at Mount Sinai showed that injections of dupilumab significantly improved both itch and skin quality in adults with severe atopic dermatitis, Guttman-Yassky approached Regeneron and its pharmaceutical partner Sanofi about pushing forward with research on this biologic drug, and a collaboration was born. A Phase 2 trial in 2014 next found remarkable improvements in a majority of 380 adults with a moderate-to-severe level of the disease who were given the drug (as opposed to a placebo). Eighty-five percent of the participants had a 50 percent reduction in both the amount of eczema and its severity after four months on dupilumab. Many, in fact, had clear or almost-clear skin. When Guttman-Yassky analyzed the patients’ tissue biopsies, what she saw was extraordinary. Dupilumab is a monoclonal antibody, which acts like a homing device to specifically target two chemical messengers – interleukin-4 and interleukin-13 (called IL-4 and IL-13 for short). These are known promoters of allergic disease. The biopsies revealed that by blocking the two interleukins, dupilumab injections were halting inflammation. But further, the dermatologist saw that “the epidermis shrank to normal levels, and the drug improved the molecules of the skin barrier. It basically reversed the disease,” she says. The accumulating research was so compelling that, in late 2014, the FDA granted dupilumab its breakthrough designation, to fast-track the therapy toward approval. Two large Phase 3 trials, with 1,300 patients, then had positive and consistent results. “The itching is the first symptom that will go away,” says Guttman-Yassky. “After that, you’ll see the red patches really melting away.” In the Phase 3 trial, “at four weeks, we saw major results, with about 75 percent of the symptoms gone.” In most of the patients, the rest of the eczema symptoms were under control by 16 weeks. With a new biologic that was clearly changing lives, in March 2017, the FDA approved dupilumab, which goes by the brand name Dupixent, for use in those with moderate-to-severe eczema that’s not controlled with standard topical creams. “Emma changed the field as her work showed that IL-4 and IL-13 are involved, not only in the acute stage, but in the chronic stage of the disease,” says Dr. Gianluca Pirozzi, Sanofi’s global R&D lead on dupilumab, who was also immersed in the studies of the anti-body, taking place at multiple centers. “This reinforced that the underlying inflammatory process is key for the disease.” She has been widely credited with proving the point: atopic dermatitis is immune-driven. When he enrolled in the Phase 2 trial at Mount Sinai under Guttman-Yassky’s watch, Jacobson knew there was only a 50-50 chance that he’d get the drug and not a placebo. Throughout the trial, he wouldn’t be allowed to use any other steroid creams or medications. Within the medical community, the buzz around dupilumab doesn’t relate only to severe atopic dermatitis. It’s about all allergic disease. Pirozzi and others have shown success with studies of this biologic for nasal polyps and asthma, while Regeneron is planning to start enrolling participants soon for a food allergy trial. The thinking is that targeting IL-4 and IL-13 along the allergy-prone pathway is getting to the core mechanism of allergic disease, in its various manifestations. “It’s the first time a molecule has been assessed in allergic and atopic diseases over a large spectrum,” says Pirozzi. “The excitement is really the change in medicine. I truly believe that this medication will change the medical care of atopic and allergic diseases in the next decade,” he says. For Guttman-Yassky, atopic dermatitis remains her passion. It’s also personal, as her daughter had severe eczema as a little girl, she has a mild condition, and she has watched patients endure symptoms that were wrecking their lives. The new therapy is changing all that. “For a first biologic, this is amazing,” she says. The dermatologist is now eager to see what dupilumab can do for children suffering with moderate-to-severe eczema – and kids over the age of 6 and teens are currently enrolling in trials. While proud of dupilumab’s success to date, Guttman-Yassky is quick to point out that suddenly there are several new treatments in the works for atopic dermatitis. In fact, the National Eczema Association gives details on most of the 65 potential therapies on its website – from other biologics to pills and topical creams for milder eczema. A NEW therapy that treats from the inside is giving many patients with severe eczema back something that they’d lost – hope. 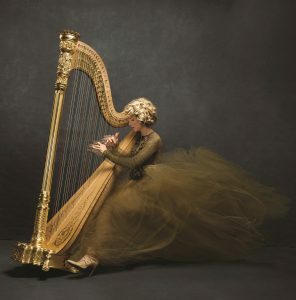 Today Lisa Tannebaum of Connecticut is able make exquisite, serene music, having returned to her career as a harpist. But for 15 long years, her life was anything but serene. 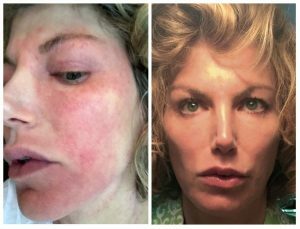 Lisa Tannebaum captured her face, before and after dupilumab. She finds her disease is so misunderstood. The word “itch,” for instance, doesn’t exactly cover it. “It’s like you’re in a frenzy, that’s the best way to describe it,” she says, and one that never ends. She scratched the skin on her eyes so badly, that her eyelashes and much of her brows disappeared. Her face was red and disfigured with swelling, and she lived with lesions all over her body, except for her legs. Between her appearance and her non-stop itching, Tannebaum could no longer perform in public. She didn’t want to be seen period, and made excuses not to see friends. Like many with terribly broken and bloodied skin, Tannebaum also suffered from numerous skin infections, especially staphylococcus. As dermatologists recommend, she’d take bleach baths and try moisturizing and wrapping, and she wore special silk clothes for eczema patients – as she could not tolerate the rub of regular clothing. In dermatology, they speak of the itch, scratch cycle. Tannebaum is happily married, loves her two kids, has beautiful music in her world, and yet atopic dermatitis drove her to this despair. Jacobson too has a family, but still knows what it’s like to go there. He chokes up a little when speaking of the depression caused by the disease, the itch and a life with almost no sleep. He too, briefly contemplated suicide. 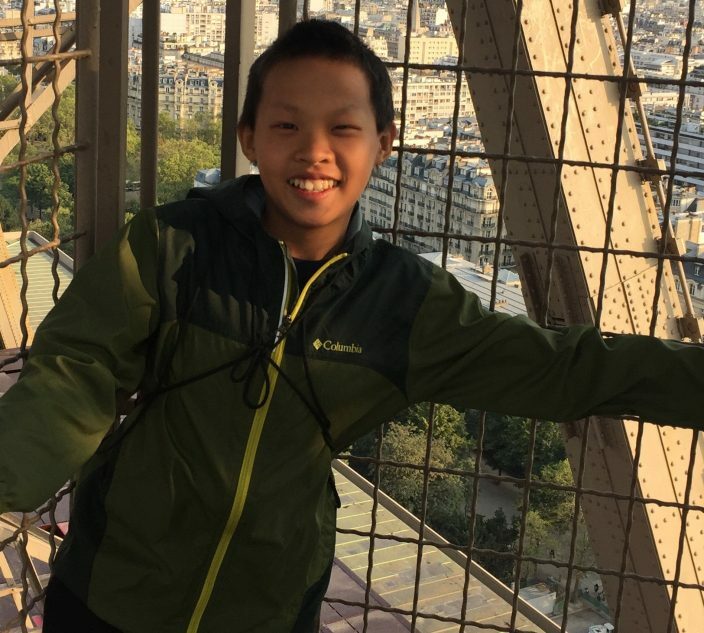 But as a volunteer EMT with the fire department in Bedford, New York, he couldn’t bear the thought of one of his EMT friends finding him dead. That pulled him back from the brink. “Before I got to Dr. Guttman, I was just miserable. I was constantly in pain, constantly itching,” he says. The turnaround in Tannebaum’s life was swift and profound. She was able to get into the Mount Sinai trial in the spring of 2015. By that summer, she was staying at her family’s place in Colorado, but flying back to Manhattan for a weekly shot of dupilumab during the trial’s second phase. During this time, she also met an orchestra conductor, who wanted to hear her play the harp, so she arranged that at her Connecticut studio. Two weeks after her audition, he called – inviting her to solo at Carnegie Hall in the fall! So after years of honing her music alone in her studio in silky clothes, Tannebaum was back. She was performing again on the big stage. During the trial, Tannebaum and other patients were taught how to give themselves the dupilumab shot, allowing for the convenience of injections at home. But she is well aware that dupilumab is a treatment for a chronic condition, and not a cure. As she gets close to needing her next shot, symptoms and itch begin to creep in. Tannebaum’s only real worry these days is about whether her insurance coverage will allow her to get the drug as frequently as she requires it. Like most biologics, Dupixent is expensive. Regeneron and Sanofi have set its retail price at $37,000 a year. Regeneron defends that price in a few ways. Novel biologics like dupilumab do require expensive clinical trials, and a Regneron spokesperson said the company took into consideration “comparable pricing for biologics for the treatment of moderate-to-severe psoriasis, which currently exceeds $53,000 per year.” Representatives of the big insurance payers also have suggested this price is in line with other biologics. Regeneron says it negotiated with insurance representatives on price and on streamlining coverage approvals before the drug’s launch. It is also offering a patient assistance program (called Dupixent My Way), to help those who qualify with either coverage or co-pay costs. The National Eczema Association says that since Dupixent was only approved in March, it’s too soon to tell how well coverage and the patient assistance program are working. But to anyone suffering with severe eczema who thinks the cost might be out of reach, Julie Block, NENS executive director, has this advice: “Don’t give up. 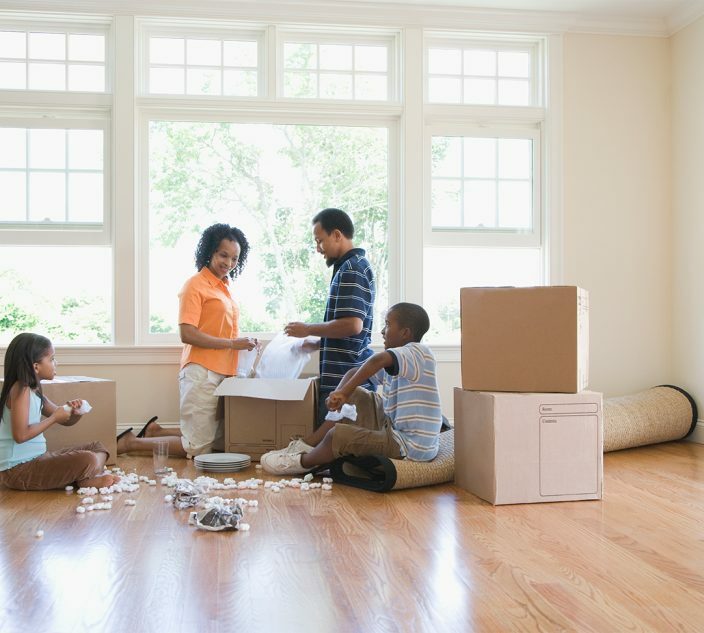 If you go through a process and your insurance denies it, appeal it.” She notes that coverage will vary by insurer. Jacobson feels fortunate that his insurance covers most of the cost. As the patient who tried it all, he calls dupilumab “life-altering.” Until this biologic, his most frequent treatment choices were topical creams, yet more creams or wide immunosuppressants, including cyclosporine, which blast the entire immune system and often have dangerous side effects. Or he’d be put on prednisone for short time, then rebound with terrible eczema once off the drug.